My son, KFP, age 7, has now joined his Daddy’s videogame streaming marathon, playing “Plants Versus Zombies” right now. They are trying to raise money to help the Animal Coalition of Delaware County, a no-kill shelter that helped us find out kitty 12 years ago. They are getting close: 65 percent of the way there! Only a few donations will help them make their goal. Please check it out, donate to help homeless pets, and listen to KFP getting silly with his daddy! This entry was posted in Link on February 4, 2018 by Alyce Wilson. A family enjoys Thanksgiving dinner. Just in time for the holiday, I’m happy to share a guest post by Amy Patterson. 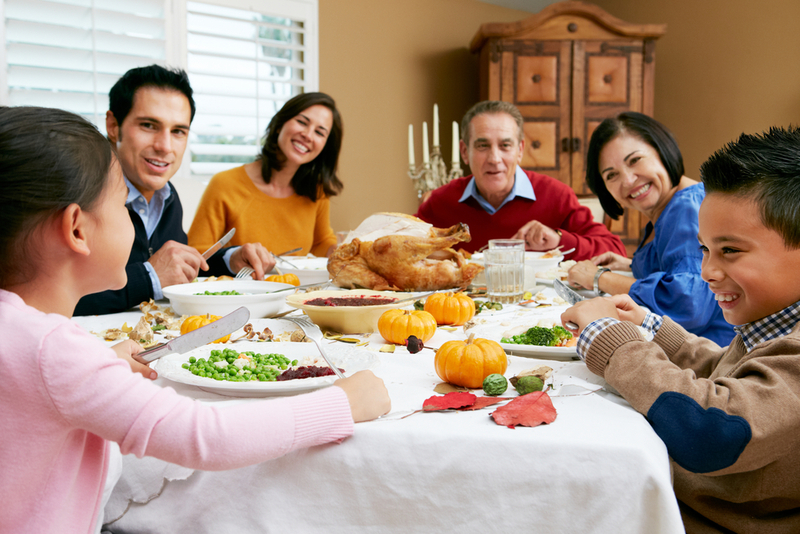 Thanksgiving is synonymous with family and food. It is the season of holiday feasts. Usually every person in the house is involved in the holiday preparations, including the little ones. While this may be a festive time, it can also turn dangerous. Safety in the home is especially important during this time, since there are many people and activities going on around you. Distractions can lead to disaster. Being prepared and aware is essential. Safety in the kitchen is more important than in any other place in the house. This is because there are many unseen hazards that can lead to a hazardous results. Hot pans, boiling water, and other food preparation equipment can cause injuries if not attended to properly. More serious injuries can also happen here, such as kitchen fires. Because of this, everyone should follow some basic safety measures while preparing for Thanksgiving gatherings. Those cooking should not wear dangling sleeves and loose clothes. That type of clothing can easily catch on fire. Always turn off the gas/stove when you are going out of the kitchen. Always stay in the kitchen when you are boiling, frying or grilling food. Remain in the house while cooking and check food regularly. Keep items away from the gas which can catch fire such as oven mitts, paper and plastic items, wooden utensils, food packaging, curtains, and towels. Keep your children away from the kitchen. Keep a fire extinguisher at your house so that you can access it quickly if required. Always check the regulator of gas before going to sleep. Make sure that all appliances are turned off. Install smoke alarms that can alert you if anything catches fire. Keep knives and sharp or hot objects out of the reach of children. Prepare your house so that is it is ready to welcome your friends and family. Make everyone feel at home by creating a nice atmosphere. A clean and decluttered home is essential in making guests feel comfortable, as well as helping to prevent injuries caused by a trip and fall accident. Make sure rugs are properly placed, and that floors are not slippery if there is rain. Be sure to prepare a list that can help you remember the tasks that need to be done ahead of time. This can be a hectic time if you are unprepared. Organization and preparation ahead of time can help you stay focused on the day of the festivities, thus helping to avoid distractions that can lead to mishaps. If you are creating a festive entry for your house, or using lights and garland as decoration, be sure that they are not placed in a manner near flammable objects or in the path of young children. Avoid candles and opt for battery operated lighting. Help keep things out of the way by providing plenty of options for your guests to hang and store personal items. Purchase a coat rack as well as some storage baskets or bins to collect gloves, scarves and hats. You can also arrange a basket for the storage of car keys. By keeping these safety tips in mind, you can help to avoid a potential disaster and focus on enjoying this time with friends and loved ones. Amy Patterson is an avid reader on trending topics and a writer in her spare time. On the beautiful coast of North Carolina you will usually find her catching up on the latest news with locals or on the beach. She loves to write pieces on health, fitness, and wellness, but often writes about families and safety. This entry was posted in Parenting Tips and tagged holidays, thanksgiving on November 25, 2015 by Alyce Wilson. Today, I’m happy to share a very timely guest post by Amy Patterson. Halloween poses some unique challenges for kids with diabetes. Halloween is about many things: costumes, ghost stories, jack-o-lanterns, and late-night fun with friends. It’s also about candy. Lots of candy. Kids, costumes, and candy. If your child is diabetic, that last item will pose a problem. If your child has diabetes, you’re likely familiar with the hazards of candy. Pure sugar with nothing else to balance it out. Halloween is probably the most intense celebration of candy in the United States these days. Halloween is also a wonderful night for children, giving them a chance to get outside in the night with friends, dress up in wild costumes, and generally celebrate their imagination. So what’s a parent to do? You don’t want your kid to miss out on a special night with friends. You don’t want your kid to be alienated by the neighborhood kids. You don’t want your kid to feel like diabetes makes her feel like an outsider. You do, though, want your kid to learn to manage diabetes at an early age. Here are some basic tips that you, as a parent, can take to ensure your child’s Halloween is safe AND fun this year. Speak with your child about his condition ahead of time. Speak clearly about proper diabetes care, stressing the concrete dangers of hyperglycemia. He’ll understand your concern, learn self-dependence, and be thrilled to earn your respect by getting the opportunity to take care of himself. Plan ahead. If you’re comfortable with this, tell him he can bring home anything he wants, as long as he waits until coming home to eat. This will ensure you can observe what exactly he eats on Halloween. Also, this plan will allow your child to have a normal, fun Halloween with the neighborhood kids. 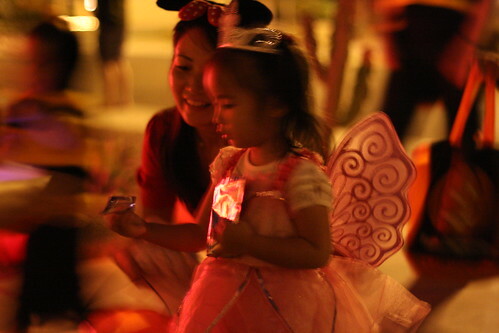 If you would rather have a hands-on Halloween experience with your child, go along for the ride! This will allow you to observe your child as she has safe, spooky fun. You can build memories, speak about pedestrian safety, and get an interesting perspective on her imagination. You’ll have fun and get to make sure you see what your kid eats. Remember that diabetic care be difficult for a child, both intellectually—it can be difficult to understand what the proper care actually consists of—and as a matter of willpower. Throwing off her blood sugar may make it more difficult to treat her; and improper use of diabetes meds is a common reason for emergency room visits. Your presence as a parent can help her with understanding as well as keeping her on task. After you’ve gathered the sweet, precious hoard, gather it up and organize portions. As a parent of a child with diabetes, you’re aware of your kid’s blood sugar and eating patterns. Diabetic children can, of course, eat sweets. But diabetic children, even more than other children, need to be careful. Rationing candy can help your child keep track of her sweets. This will also allow her to eventually eat all of that good candy WITHOUT overindulging. Wrapped candy can last a long time, after all. You could even make your Halloween harvest the entire year’s candy ration, doling it out in small doses when the occasion calls for it. This entry was posted in Parenting Tips and tagged diabetes, Halloween, holidays, parenting, tips, trick-or-treating on October 24, 2015 by Alyce Wilson. My son, a kindergartner, has to do homework four times a week. While that might sound excessive, the assignments currently consist only of a page or two of simple number recognition exercises in his math booklet. In addition, the teacher sent home about 20 optional activities designed to reinforce letter sounds, sight words and vocabulary. Last week, KFP and I did one of the activities, creating silly sentences, where each word started with the same letter. We agreed that anything starting with “B” (balloon, boy, bus), should bounce, and that anything starting with “T” (train, tiger, truck) should travel or trip. After we’d done a series of silly sentences, KFP suggested we sing some silly songs. No rules; just improv, the sort of thing we’d done before while taking a long drive. He started us off with a song called “The Elephant Drives a Truck.” We took turns singing lines, with no real rhyme scheme, telling a rambling story of an elephant who crashes into everything and then gets in trouble. “Now let’s sing another one,” KFP said. “Sure, I’ll start this one,” I said and began a song about leaves falling off a tree. KFP interrupted me. “That’s not funny,” he said. “What’s a punch line?” he asked. “Ohhhh!” he said, and I could see enlightenment sweep across his face. I realized at that moment that most of his humor is conceptual, about the ridiculousness of the premise. I explained that humor can also come from playing off expectations. The unexpected can be funny, I told him, and hammered the idea in later when one of his shoes fell off while he was walking. We started again, creating a silly country-western song inspired by the upcoming Farmer Fun Fall day at KFP’s school. We even rhymed occasionally: “Come down to our jamboree, where we’ve got cows and pigs for free!” At the end, we both called out “Yee-haw!” in unison. If we’d have been on the stage, that would have been a great blackout moment. But since this was real life, and he is five, he kept trying to recreate the magic of that silly elephant truck song. In the coming days, we sang about a rabbit driving a tractor, about a mouse driving a bus, all essentially the same rambling saga of animal-wrought destruction and chaos. Then, as we were sitting on the grass, waiting to pick his friend up from his bus stop, KFP asked if we could write another silly song. “OK, but let’s make this one different,” I requested. He had to stop singing then, because I laughed uncontrollably for minutes. My pupil. This entry was posted in Mommy Files and tagged fun activities, humor on October 20, 2015 by Alyce Wilson. The other day, when he got home from kindergarten, my boy, Kung Fu Panda, wanted to play the new LeapPad game we’d just downloaded as a reward for earning enough stickers on his sticker chart. I was out of the room, doing dishes or putting things away — it’s always at least 30 minutes before I get to sit down — and returned to find KFP looking upset. “It won’t let me do anything,” he said. I took the device from him to have a look. Sure enough, the LeapPad was doing something I’d never seen before: instead of starting up, the display showed a LeapPad with an alert symbol on it and a white cord connecting the LeapPad to a computer. “Guess we have to connect it to the computer,” I mused aloud and pulled the white cord out of the cabinet. Once connected, the screen directed me to download the LeapPad Connect software, which I soon surmised was a diagnostic tool for finding and fixing problems. After a couple false starts — including moving from my dinky notebook to my husband’s laptop in order to see the full screen of the application — the program began a lengthy process which seemed to involve a complete reinstall of his LeapPad’s software. Uh-oh. Gently, I explained to KFP that, when his LeapPad was fixed, it would have the programs but not the settings. I didn’t go into detail, for fear he’d be upset, but I was fairly sure that all of his photos and drawings, his stickers and badges earned from playing his games, would have disappeared into the ether. And then the most amazing thing happened. Nothing. “I guess I need to take a new picture for my profile,” he said. I tried to walk him through it, but he didn’t need much help. He chose a new background — a tropical fish tank — and opened the virtual pet game to recreate his little brown monkey, Bimbie Baby, completely redecorating his apartment. “Look, he has a flatscreen TV now!” he told me. Later, opening up the logic game where you build a town by solving space puzzles, KFP was delighted to see the town completely empty. “I’ve been wanting to rebuild it,” he told me. If only he was always this flexible. If only I was. An eon ago, in my pre-child days, a yoga instructor tried to explain the principle of attachment. At the time, I’m not sure I understood him as well as I believe I do now. No zen koan can teach the principle of attachment quite as well as motherhood. For I challenge you to find another experience where you are so deeply attached to someone, and yet where you are constantly reminded of the need to let them go. From the instant he began to smile at ceiling lights — we said he was laughing at his guardian angel making silly faces — I knew the full realization of his life and being would one day lead away from me. From his first steps, to putting him on the bus to school, I couldn’t deny that this kid was going places. As a friend once told me, everything is a stage. Crying at the top of his lungs every time you go to the grocery store? A stage. Peeing his pants because he can’t stand to tear himself away from his toys? A stage. But so, too, are the good stages, such as when he sits close to you, cuddling your arm, just because he feels like it. It’s all a stage, and everything is always new again. I hope I can learn from KFP how to look forward to all the new challenges ahead, to build things anew. This entry was posted in Children's Media, Mommy Files and tagged technology on October 4, 2015 by Alyce Wilson. When my son told me that the adjusting band had broken off his beaten-up black Dave & Buster’s baseball hat, I have to admit I was secretly glad. To say the hat had seen better days was a severe understatement. First, it had first lost the metal button on top. Then, over years of exposure to sun and rain, it faded, growing more and more distressed. Nine months out of the year, he wore the hat nearly every time we stepped outside, a habit encouraged by me in order to protect his fair skin. In winter, I managed to convince him to wear a winter hat, instead, one that covered his ears. Because of his larger-than-average head, we’d bought him a one-size-fits-all hat, adjusting it for the smallest setting. As a result, its large brim cast a shadow over his face, ruining many outdoor photos. While I didn’t mind its distressed appearance, lately the hat had begun to go downhill severely, first with a loose thread on the brim, which I clipped. Another thread followed, and soon the entire brim was frayed, with the black plastic of the brim protruding slightly through the cloth that covered it. But still, the hat was my son’s favorite, and so I kept hand washing it in the sink, clipping off the fringe, and attempting to make it somewhat presentable. Of course, since it was one-size-fits all, little hope existed of him outgrowing it, and I was increasingly more embarrassed sending him out in it. Yet, he loved the hat so much that I had trouble hardening myself and making a huge decision, like refusing to let him wear it. So when the little voice called from the back seat to say that “something important fell off my hat,” I had to stifle a little cheer. I took a look at it and proclaimed it unwearable but headed off tears by reminding him he had several other hats to choose from (hats I’d bought in the mistaken belief I could entice him into wearing them). This morning, on his way to school, he consented to wear one: a bright orange and green cap featuring a surfer with the word “California” on the back. At first, he seemed OK with it. After all, the cap contained one of his favorite colors, green. But then, as I’d feared, he dissolved into tears. I got down at his level and asked him what was wrong. He told me, “I don’t feel like myself without my hat.” I kissed his tears away and reminded him he wears different clothes every day, and he’s still the same person. By the time we got to the bus stop, he was smiling again, receiving a compliment from his bus friend on the cap. But between you and me, I’ve covered my bets. Just in case, I’ve ordered a black baseball cap from eBay. This entry was posted in Mommy Files and tagged fashion, parenting on September 17, 2015 by Alyce Wilson. Mommy Files: Oh, Hello There! I never intended it to be so long between entries, but I have had difficulty keeping up with my blogging. In part, I got out of the habit when the Yahoo! Contributor Network went under, which had kept me writing on a more or less regular basis. Then, with a growing boy, my life soon became filled with classes ranging from sports (at various times, hockey, tumbling, soccer, a sports sampler, and swimming) to piano. Not to mention kids’ birthday parties, events at his preschool and the like. But a college buddy asked me, at a Labor Day party this weekend, if I could spare five minutes a day to write SOMETHING. I had to agree that yes, I could. So here I am, getting back in the game. My son and I are currently watching a “Shaun the Sheep” DVD, made by the same studio that does the “Wallace and Grommit” shorts and movies. There is almost no dialogue, and it is good, silly fun. Exactly the sort of thing my mild-mannered boy enjoys. Sadly, we won’t be seeing the feature film, because the previews showed a scary-looking animal catcher, literally gunning for the sheep (although with a science-fiction looking device, rather than a gun, per se). *sigh* Why is there this villain obsession in Hollywood? There are ways to create good stories without always relying on an evil nemesis, threatening to kill the protagonists. I expected better from “Shaun the Sheep.” But at least we have the TV shows to enjoy. Before YCN shut down, I downloaded all of my articles, and I will soon begin posting my best articles about parenting tips. This entry was posted in Children's Media, Mommy Files and tagged TV shows on September 12, 2015 by Alyce Wilson. This entry was posted in Link and tagged yahoo, yahoo contributor network on July 2, 2014 by Alyce Wilson. This entry was posted in Link, Parenting Tips and tagged attractions, museums, parks, philadelphia, things to do, yahoo, yahoo contributor network on July 2, 2014 by Alyce Wilson. The second of three poems I read for the Lansdowne Public Library in April, this one based on my experience getting KFP fitted for a ringbearer suit. One of favorites! This entry was posted in Mommy Files and tagged parenting, poetry, video on June 27, 2014 by Alyce Wilson.